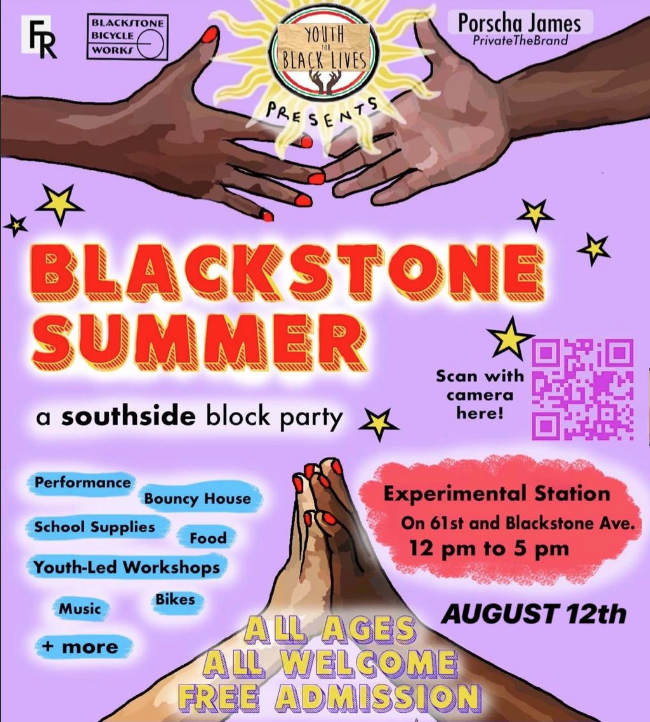 Youth for Black Lives hosts their first block party in collaboration with Blackstone Bike Works, Experimental Station, Porscha James’ “PrivatetheBrand” Back To School Project, and Fortune Management! Blackstone Summer's primary offering is a youth-led teach in: an opportunity for young women and gender nonconforming folks to lead workshops for other young people on a variety of topics (past workshops have covered environmental racism, the criminalization of domestic violence survivors, bike mechanics basics, poetry as healing, and more). The teach in topics are chosen because they are relevant to the day to day lives of young people of color, shaping their capacities for artistic expression, self-love, and advocating for themselves and their community. Blackstone Summer will also have live music, free food, information and services provided by other organizations (including free school supplies), festive activities for all ages.. The music portion includes performances from Christian Jalon (@christianjalon), Aaliyah Allah (@aaliyahalllah), and Kari (@nombreKari). Let us know you are coming through Facebook or Eventbrite! voices of young people within the Black Lives Matter movement, seeks to provide opportunities for young people to reclaim their voice through the power of education. Recognizing the myriad challenges faced by black youth seeking education, our teach-ins aim to challenge power structures between teacher and student, for a more equitable distribution of responsibility. Youth for Black Lives wants to allow young people to create networks of information, sharing the tools and skills that we need, yet are denied within traditional educational institutions. Blackstone Bicycle Works is a youth education program of the non-profit Experimental Station, located in the Woodlawn neighborhood. It offers youth the tools to build and maintain their own bikes, participate in healthy competition, team-building, and more. They have offered their space to Youth For Black Lives twice prior to the upcoming event. First, for a public meeting with Superintendent Eddie Johnson and again for Youth for Black Lives’ first Youth Teach-In. The Bike Shop will have a tent at “Blackstone Summer” and is in strong communication with all collaborators. For more information about Blackstone Bicycle Works, visit https://experimentalstation.org/blackstone. experiencing their debut stages. Fortune is coordinating several of the performances at the event, in addition to offering a workshop on artistry cultivation. “Back-To-School” is a portion of the event dedicated to assisting young people in their return to school in the Fall. Porscha James has contributed her event planning experience in organizing “Blackstone Summer,” and is offering resources and supplies for those in attendance. For more information, contact Matthew Searle, Assistant Director, at matthew (at) experimentalstation.org or 773.241.6011.